WHAT TYPE OF CHURCH IS FAITH CHURCH? We are a growing church with a big vision who has been serving the Tulsa community for over 90 years. The MISSION of our church is to CONNECT people to God, GROW in relationship with God and other, and GO into the world and make a difference. Our main service is on Sunday Mornings at 9:30 & 11 at the Faith Church campus. We also have an Online Campus that meets at the same time. Our vision is to go to a multi-campus format in the near future. We also have Community Groups and other classes for adults and teenagers on several other nights of the week. You can check our calendar for these times and locations by clicking HERE. There is no dress code for attending services at Faith Church. Some attenders dress casually and some dress up—it’s all good! You are free to come exactly as you are, so wear whatever you are most comfortable in. When you arrive at Faith Church, you will enter in to your campus’s main lobby. You’ll be greeted by a friendly smile from one of our greeters. There will be some refreshments for you to enjoy on us, and you can check your kids into our kids’ ministry, Fusion Kids. There will be a 5-minute countdown to let you know when service will start, so you can be sure to get your seat before the service begins! We always start our services with a time of energetic, passionate praise and worship. Once worship is over, our First Lady, Lisa Goins will share a word of encouragement and prayer. We’ll then continue our worship through an offering, which flows right into the weekend message. Most weekends, our Lead Pastor, Kelly Goins will preach. Our services close with prayer response. We want to give God plenty of time to speak to us and for us to respond to God according to our spiritual temperament. Our service schedule however, is not set in stone. Our services are dynamic, our goal is to CONNECT to God. Sometimes the order of service will change to as to keep in step with where God’s Holy Spirit is leading us. Our Fusion Kids ministry provides an amazing weekend experience at every service. Visit the Kids Ministry check-in kiosk where our team will register your children and give them a name badge with a parent pick-up tag. Please let us know if your child has any allergies or special requirements during the check-in time. If we need to contact you during service, we will text you on your phone or just come let you know there is an issue. This is very uncommon. At the end of the service, simply show your parent pick-up tag to the classroom personnel upon entrance into the Kids area, then your child will be released to you. 1) Did you have fun? We think you’ll be impressed with their answers! The best way to get connected is through NEXT STEPS (NEXT). This is a four-week experience that meets on-campus following a weekend service. We offer NEXT almost every month. In NEXT, you’ll hear our story, catch the vision and values of our church, and find out how you can join in on what God is doing here at Faith Church. We are growing and as a result, we are running out of parking. But, we’ve got you covered! We will pick you up at your car before service and deliver you right back, literally NO WALKING. How do we do it? When you park in our Additional Parking area just south of Faith Church, a Valet Shuttle will be right over to pick you and your family up and deliver you back to your car safely after service is over. If you’r a Single Mom or Dad with a stroller or a child in a car carrier, we’ve got you covered too. We have reserved spaces for you right up front, as well as plenty of handicap parking. Parking is no problem at Faith Church. We’ve got you covered. 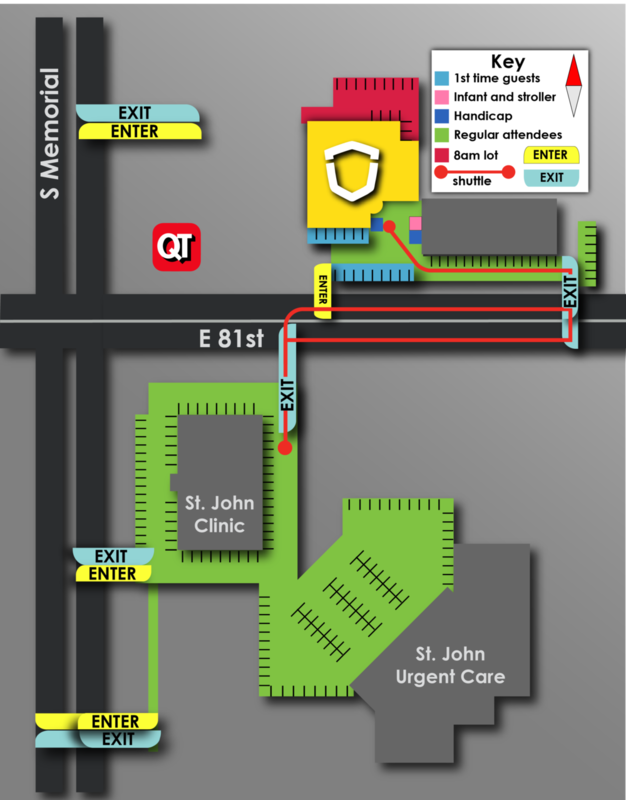 Click the image below for a map of our parking lot.